Hey there, this Wednesday is the last GT Farm Urban Farmer’s Market of 2010. 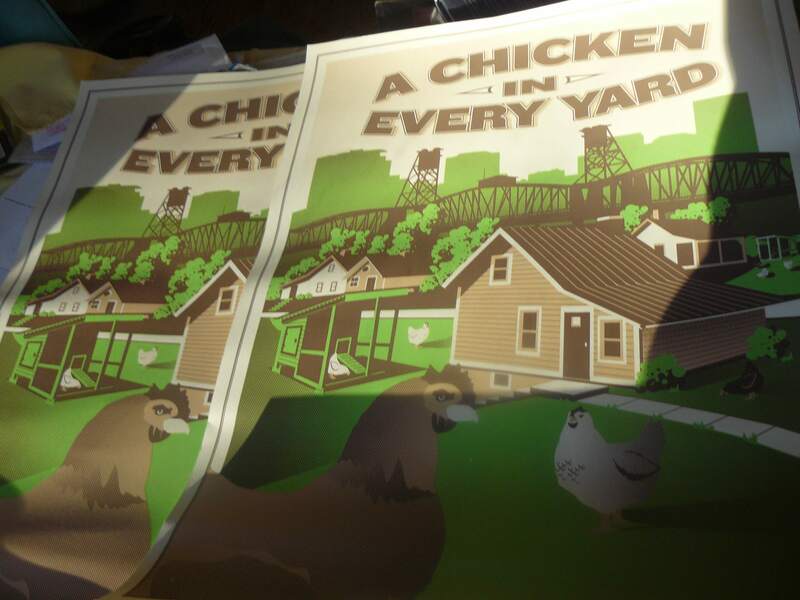 There will be a handful of vendors selling goodies like honey, eggs, jams and produce. I’ll have bunchs of the famous black curly mustard, rapini, chard; jars of fig jam, and guava goo; and t-shirts for sale. We’re starting early–3pm and only going until 6pm because of the horrid darkness. Hope to see you there. When: Wednesday, Nov 17. Starts at 3pm-goes to 6pm. I’m going to close the gate at 6 o’clock exactly (it’s pitch black by then) so plan to arrive before 6pm. There are two books that I’ve been using in heavy rotation in the kitchen. Both are about Italian food, and old ways of doing things–two of my favorite topics. The first is called Cooking with Italian Grandmothers by Jessica Theroux. I heard about Jessica’s project through a DVD called Rabbits and Wrinkles, short documentary films of Italian grandmamas wandering around in funny socks and picking weeds, then showing us how they cook them. The grandma I watched cook was from Calabria, the extreme southern part of Italy. She pulled up bean plants in a foggy field, shelled and then simmered them in a wood-fired oven. She got out a basket and foraged for wild greens. I felt deprived that I wasn’t there to eat this amazing feast she prepared from the earth. The DVDs morphed into CwIG, and chronicles Jessica’s journey around Italy, and her lessons in cooking. For Thanksgiving I’ve decided to ditch the turkey and make a series of dumpling/dumpling related foods instead. Stuff like rabbit raviolis and Polish plum dumplings. 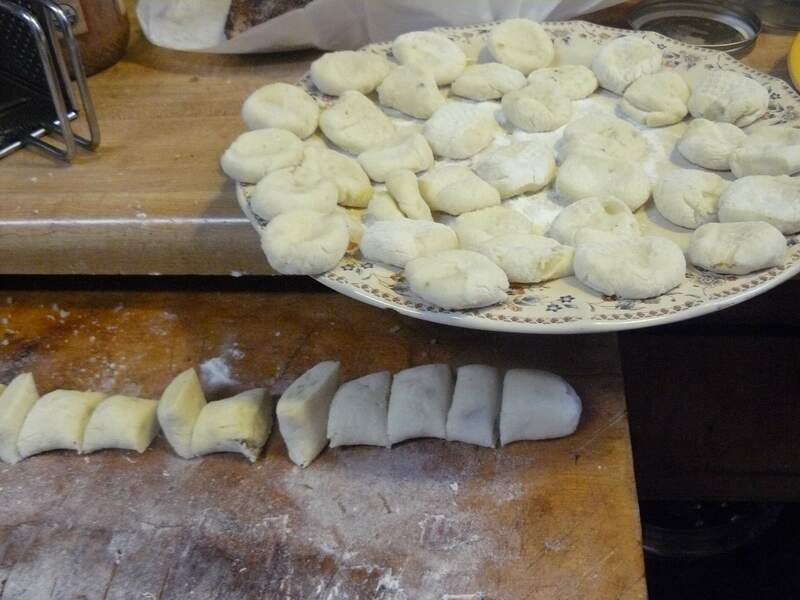 CwIG is going to help that dumpling dinner: I loved the gnocchi recipe, which yielded these light and chewy friends. I also have plans to make the baked semolina gnocchi. Oh! And the Polpette di Bietola (chard-sesame balls) –an amazing sounding/looking concoction of steamed chard rolled into a ball with ricotta, bread crumbs which are then rolled in seasame seeds and baked. The second Italian grandma book involves a grandpa. It’s My Calabria, a cookbook about Calabrian food by Rosetta Costantino. I met Rosetta through a friend and have taken a cooking class from her before (see Hamish Bowles hilarious account of our antics in the November issue of Vogue). And I recently met her father and mother, who are old-school Italians, and are bad-asses in the garden and kitchen respectively. The book is really a love song to the old ways Rosetta’s parents do things: they reuse everything, they preserve and save things for winter, and they seem to grow or make most things they need. Rosetta’s dad, for example, grows and dries his own peppers and his wife grinds them up to make Peperoncino. The tomato trellis in their garden is truly amazing. 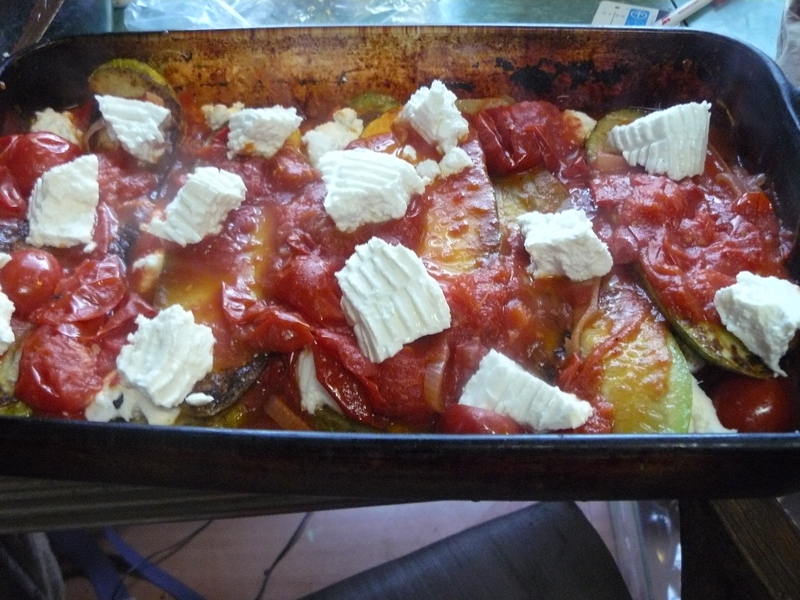 Don’t worry that you’ll have to use hard-to find ingredients–the Calabrians are all about tomatoes, onions, and zucchini, seen here in the Parmigiana di Zucchine that I made the other night. But there’s also some weird stuff too! Like the Pitta con Verdura, which is like a calzone but stuffed with borage leaves (if you don’t have borage, you can use chard instead). I had never eaten borage leaves before, but now will never go back, they are so buttery. One of my favorite sections was about the Calabrian pantry–how to make salt-cured anchovies, sun-dried zucchini (wtf? i never thought of that! ), candied orange peel. 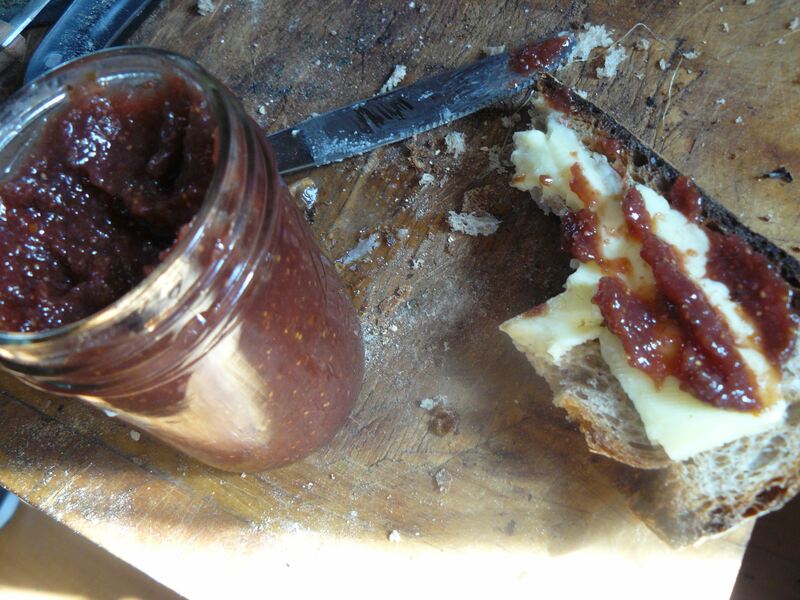 Rosetta tells us that Calabrians never waste anything, so when I found myself with a bunch of figs, I made the Marmellata di Fichi with lovely results. For dessert on Thanksgiving, I might attempt the Chinulille, sweet ravioli filled with ricotta and candied orange and then (gulp) deep fried. I’m also looking lovingly at the photo on page 153, which is of a pair of goat stomachs which are hanging on some smoky beams. The stomachs aren’t to eat, but are used to make rennet, something Rosetta’s dad did when he was a goatherder and cheesemaker in Italy. This page is especially enticing to me as I have three bucklings on my hands this year, and am faced with the fact that they will not be able to stay–so why not make some rennet and then cheese from that rennet? To use every part, to transform something sad into something delightful. Both of these books made me have hope that old ways can be rediscovered, as long as we are interested in them. Happy Thanksgiving-planning. It’s kind of bittersweet. This weekend, our longtime neighbor D moved away from the 2-8. I’ve watched her kids, Bear and Unique, grow up from little kids into teenagers. Now there’s just a pile of leftover things in front of the house. Sure, D had issues: she always had a crazy boyfriend, she drank too much, and she played her music loud into the night. I always liked her, though, because she was sweet and real. She also used to give people who stopped by the garden a (probably slightly nonsensical) tour. We had some good times together and I’m sure I’ll see her around. Her leaving made me realize how much our neighborhood has changed in the last 8 years. Bill and I took a Halloween walk last night. We stopped by a friend’s warehouse/music venue on West Grand and San Pablo. He’s remodeling the place, putting up walls and rooms, making a recording studio downstairs. He told us there are three art galleries/music venues within a few blocks. There’s a place called Produce Pro (pro-pro?) going up across the street from his warehouse. Then we kept walking to downtown, seeing a posse of scraper bike kids riding up Telegraph. The Arts High School at the Fox was putting on a play called Haunted School, and cool kids hung out on the corners. At Chinatown we considered getting dumplings at our favorite Chinese restaurant, Shanghai, but decided we should cook at home. We took BART to MacArthur so we could see people in costumes on public transportation (why do I love this? Dunno). We walked down Telegraph and went into Oasis, this relatively new middle eastern store/resto/hang out. I love this place because people can gather there (the Giants game was on) to have dinner or drink tea, or eat some baklava. The food is excellent and the Muslim community has made this their hub (there’s a mosque around the corner). Continuing down, Khalid the beekeeper and honey guy is setting up his shop a few blocks away from the Oasis. On 29th Street, a British guy (Bill thought he was Irish–maybe he was?) was putting away the sidewalk tables of his new restaurant/pub Commonwealth. We got to chatting with Ross and looked at the menu: bubble and squeak, beans and toast–classic pub food. They’re open for coffee/toast/tea in the morning and I hope to get over there soon. Then we walked under the overpass to home, and there were so many memories–the place where Bill went skateboarding and fell and hurt himself, the parking space where someone camped out for a whole year, the backyard that used to host the most outrageous parties. The billboard still advertised the County Fair, which took place in June. We looked up at the apartment building where a few nights ago a woman called to us while we huddled under an umbrella, from her window: “it’s raining, it’s pouring, the old man is snoring” and then we waved at her and yelled Happy Halloween and she waved back. Now it was Halloween and it wasn’t raining, and everything seemed to be changing, but it felt very familiar, if that makes any sense. Back on 28th street, the monks’ pit bull was sniffing around the street. The smell of the garden–rank in places, green and fresh in others–wafted in the air. I could hear the goats nickering to their kids to come down from the stairs. Our cat Cuzzin was asleep on the couch. I spent the rest of the night reading Goat Song, and making plans for expanding the garden into the fall and winter. I want to build a greenhouse and a proper hay shed, a full-on outdoor kitchen. The other night we were making pizza in the cob oven and a guy and his lady walked by. “Is that a fire?” she asked, and I invited them in. They peered over the fence, “we have to go,” he explained and paused. “But you know, thank you for the invitation. I really appreciate it.” This is what I love about Oakland–we’re all here, figuring it out together, making a community, and inviting others to join us. So even though my neighborhood is changing–some might say gentrifying–I think it might be okay, as long as we all retain that spirit of sharing resources, expressing who we are, and prioritizing interaction with each other, all at the same time.